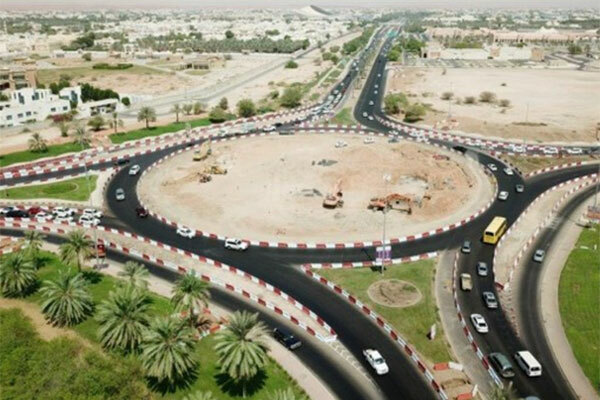 Abu Dhabi General Services Company (Musanada) said that it is currently working on four projects worth Dh438 million ($119 million) to convert roundabouts to signallised intersections, construct underpasses, and ease traffic flow in Al Ain city. "These four development projects form part of Musanada’s efforts to realise the vision of the UAE’s rational leadership towards providing high quality infrastructure that meets the needs of individuals and the community at large in line with best international standards," Saleh Al Sheibah Al Mazrouei, Musanada’s acting roads and infrastructure executive director was quoted as saying in a Wam report. Al Mazrouei explained that the scope of the first project includes converting the Al Aflaj - or Hilton - roundabout to a signallised intersection and covering the top of the existing underpass. The project also includes widening the roads surrounding the Al Aflaj roundabout by providing three lanes to inbound traffic from Mazyad towards the Al Ain industrial area, besides providing three other lanes for inbound traffic from Mazyad towards the Al Ain city centre. Also providing sidewalks for pedestrians and landscaping at the project area. He noted that Musanada, in collaboration with the Department of Transport, Al Ain City Municipality and Abu Dhabi Police General Headquarters, has partially opened the Al Aflaj roundabout, pointing out that the project will provide six lanes for inbound traffic from Mazyad heading to Al Ain Industrial Area and the city centre, assuring that work is progressing for a full opening during the first quarter of 2019. Al Mazrouei added that the second project relates to developing and converting existing roundabouts to signallised intersections at the city centre, indicating that the project covers five roundabouts with three lanes at each direction. The project scope includes changing all the roundabouts to signallised intersections, increasing the number of lanes of each direction, and adding a new intersection to serve the Khalifa Bin Zayed Al Nahyan Mosque. He said that Musanada was planning to hand over the project in full after completing all the works in November 2019. Al Mazrouei noted that that the third project aims to ease traffic flow and involves construction of an underpass at the Sultan bin Khalifa Roundabout, which has three lanes in each direction. The project scope includes changing the roundabout to an underpass at the western side, in addition to installation of traffic lights above the underpass. Musanada plans to complete all the works related to the project by April 2020. He added that the fourth project aims to enhance traffic flow across the roads surrounding the New Al Ain Stadium at the Al Tawiyah area. It involves converting the two roundabouts with three lanes in each direction to signallised intersections, increasing the number of lanes in each direction, covering the top of the underpass, construction of signallised intersection and construction of a pedestrian bridge. The work is moving as per the agreed plan and is expected to be completed and handed over by December 2019.